Termites might seem like nothing but pure evil when you find them in your home since they are slowly and methodically chewing their way through your walls, floors, furniture, and anything else made of wood. And they never sleep! They spend 24 hours a day, seven days a week working, eating, and reproducing. Wood isn’t what termites crave, per se. They are actually after cellulose, which is found in abundance in wood. It is also found in all kinds of organic matter, including dried leaves, flowers, pits and seeds, and the branches and twigs of plants and shrubs. Termites are one of the few beings that have cellulase, an enzyme that is required to break down cellulose and turn it into usable material. Without it, the wood and plant matter would not be able to break down, and we’d have mounds and mounds of dead trees and plants just lying around. Termites are also able to eat other unwanted material, like animal feces, and convert it to material that provide nutrients and other benefits to other insects, bacteria, fungi, plants, and so on. When termites live and work in the forest (where they belong! ), they make things safer for all of us. They eat up the fallen trees that would otherwise provide fuel for a forest fire that could spread out of control and eventually consume houses and other properties. They eat up the dead leaves, plants, and other matter littering the forest floor, allowing the free flow of oxygen through the forest. Termites make the forest safer, and they make all of us safer in the process. Besides creating compost that improves the nutrient richness of the soil, termites also provide other benefits to the soil. Termites burrow into the soil and create an extensive network of tunnels for travel and for housing their colony. In the process, they aerate the soil so that it is not as dense and is able to absorb more moisture and nutrients. The burrowing also creates macropores in the surface of the soil that allow for moisture to penetrate. The result is that there is less surface water runoff and erosion. If termites are relocated, such as through construction, they will carry that nutrient-rich soil with them as they travel, transferring the benefits. Nitrogen is necessary for many of the organisms on our planet, but it is often attached to ammonia, which makes it unusable. Termites are one of the few creatures that can “fix” the nitrogen, or separate it from the ammonia and make it usable. Termites achieve nitrogen fixation through their digestion. They eat material, break it down, and produce ammonia-free nitrogen. Through this process, they create nitrogen-rich soil that provide nutrients to other flora and fauna. Understanding the good that termites do may help you appreciate them a little more. That doesn’t mean you should want them in your home, but you may let go of your desire to eradicate them entirely. Be glad that they are out there in the world, but don’t be glad if they are in your home. Call a termite exterminator in Glendale that can get rid of them and protect your property. Otherwise, you’ll be looking at thousands of dollars’ worth of repairs. 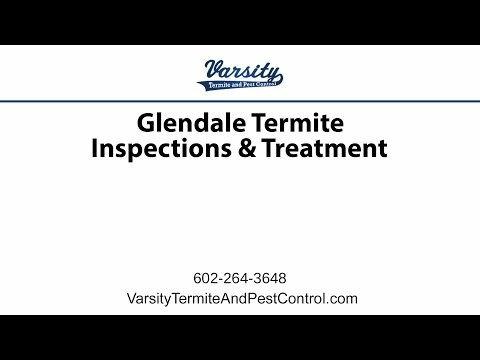 Varsity Termite and Pest Control is a top-rated Arizona termite company. We offer generalized pest control services, but we specialize in termite pest control. A termite exterminator will inspect your property to find the source of your termite infestation and will develop an effective plan to get rid of the termites and protect your home. We focus on elimination and prevention, helping you to preserve and protect your investment. Call us today to learn more about your termite control options or to get an inspection to find out if termites are too close for comfort. Can Termites Move From House To House? Read the rest of Can Termites Move From House To House?